This is a simple, quick to assemble and delicious chicken recipe. We prefer chicken thighs because we think they are tastier. I am sure this would be delicious over chicken breasts as well. If making chicken breasts the cooking times could vary. This whole dish from start to finish was just under an hour!!!! Now that’s a recipe I can get behind. Hope you enjoy it as much as we did. The basting is important. So set your clock to go off every 10 minutes . Whole chicken dish should cook in 1/2 hour to 40 minutes so that’s 3- 4 basting times. I cooked for about 38 minutes. Use a spoon to baste. 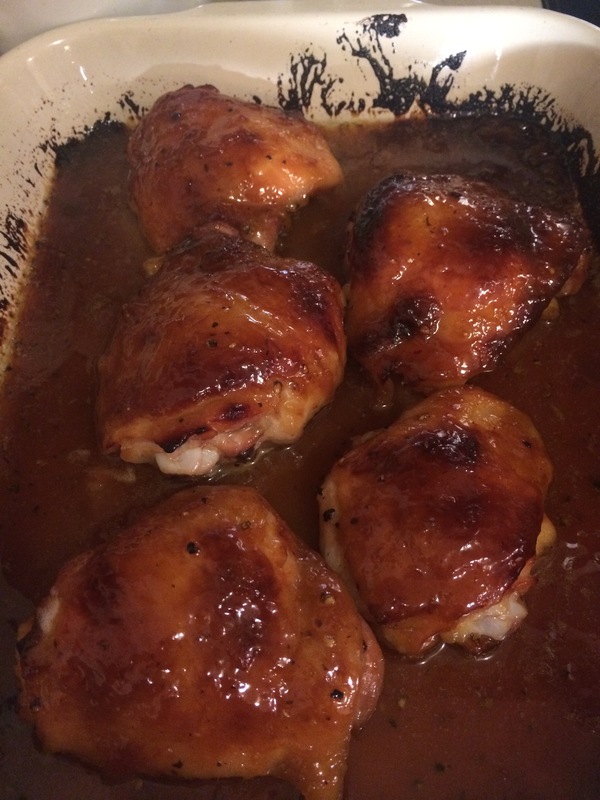 8 chicken thighs will serve 4 people–I made 5 but wanted to check amounts of ingredients so I used full on amounts of sauce which worked out fine and made for easier basting and enough sauce for serving. This recipe will be perfect with 8 average size thighs. 6-8 chicken thighs (check that they aren’t very small) average to large size thighs –I used bone in thighs. You can use whatever kind of chicken you prefer but I used bone in thighs. Rinse chicken thighs and pat dry. Transfer to a sprayed baking dish ( cooking spray) Season chicken generously with kosher salt and freshly ground black pepper on both sides. Set aside. 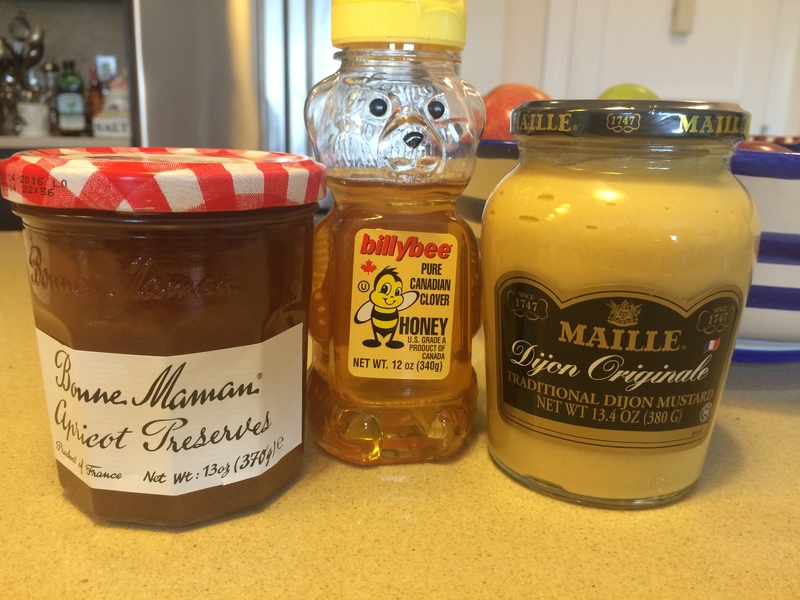 Bring jam, honey, and mustard mixture to a low boil in a small saucepan over medium heat. Once it starts to boil reduce heat to medium-low or just low. Simmer until sauce thickens and gets reduced by about half, app. 15 minutes. Spoon apricot mixture over chicken thighs in baking dish, spread with spoon to coat evenly. Bake chicken , basting with sauce from bottom of dish every 10 minutes. Cook until juices run clear when chicken is pricked with a fork. 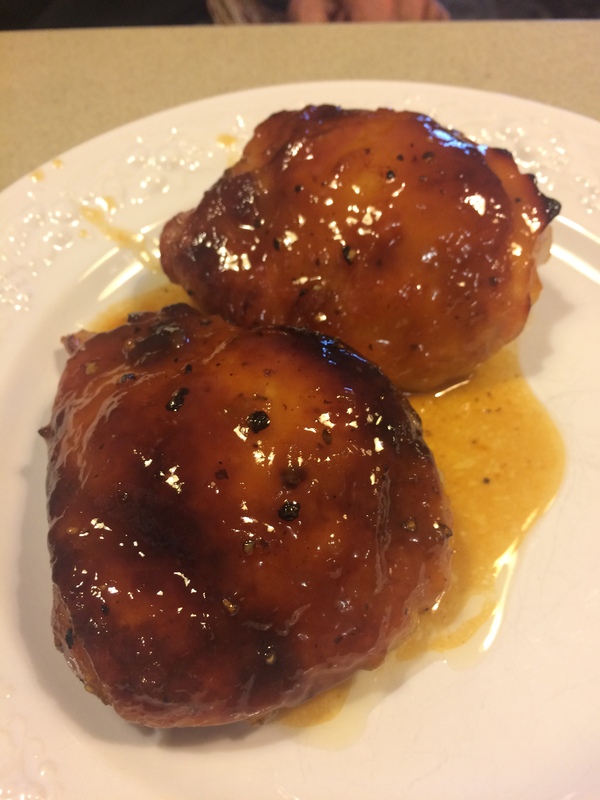 Anywhere from 30 – 40 minutes depending on the size of your chicken thighs. If your chicken doesn’t get that browned up you can always put it under the broiler to crisp up for a few minutes. Just keep an eye on it if you do this. This entry was posted in chicken and tagged Chicken, chicken with apricot and mustard, dijon mustard and apricot chicken. Bookmark the permalink.